Finding Your Way: Maps, Compasses, and Treasure – Oh My! When I was a kid, there was no internet and there were no smartphones. The same is true for when I was a high school and a college student. The practical upshot of this meant that I was lost a lot of the time. Turn right, then left. Second street over. My sense of direction is not super great, but I did learn early on how to read a map. Each summer I spent in New York had me walking the streets with my handy, plastic-coated street map unfolded, stopping to peer closely at each intersection. “You look like a tourist,” I was told. “But I am not lost,” I responded. The thing about maps, they’re fun. While I do rely heavily on that little blue iPhone dot these days to tell me if I’m heading in the right direction, there’s something great about a map, a real map. Additionally, I’m staggered each year by the sheer number of my students (high school students!) who don’t know what a cross street is. So today, may I suggest having some fun with maps and directions. You might think you know your neighborhood pretty well – but do you? Take a walk with a notepad and pencil and map out your block. Measure for accuracy if you want. Include key landmarks like trees (did you adopt one last week? ), potholes, angry dogs, and bodegas with the best Halloween candy. Go home and draw your map out on big paper. Depression-era itinerant workers and “hobos” used to chalk signs outside houses to let each other know where to find food and shelter and to pass on other useful information. 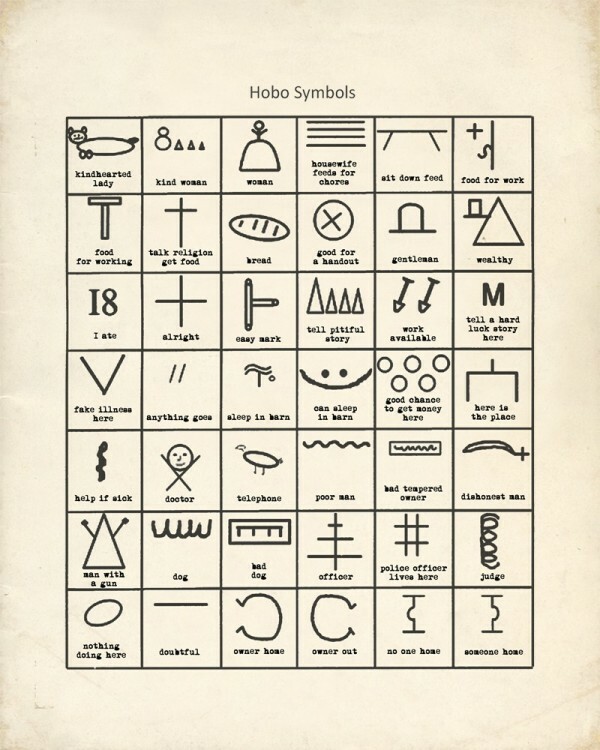 Adopt some of these symbols for your map, or create your own. I remember doing this in grade school, and then having my own grade school students do this. And you know what? It doesn’t stop being nifty. Plus, it’s a necessary step for Suggestion Number 3, so get on it. I did not take photos of myself doing this activity because I am 1. writing four 40 page papers, all due in the next two weeks, 2. exhausted, 3. unskilled at self-photography, and 4. unsure what the point would be since this website breaks it down step by step in such a way that there’s no need for any of us to do it ever again. Got yourself a working compass? Great! Head to a park or some other large outdoor space if you can, although this activity could certainly, with some ingenuity, work inside your house or apartment (and might, as such, be a great rainy day activity). Select a starting point and an endpoint. From the starting point, using your compass, create a series of directions that will eventually lead you to the final point. For example: go north seven giant steps. Hide a “treasure” at your final destination. Trade off creating and following directions and finding the “treasure”. Pre-set this activity for a party, a sleepover, or a surprise activity. Previous Previous post: Get Outside! Next Next post: Mr. Wuffles!